A weekend with no plans + a Mad Men marathon = one tan tank sweater that is DONE!! By “done,” I mean that it’s off needles. I still need to weave in the ends, and yes, for the first time in my 20-year knitting career, I will need to block it. Maybe sometime soon I’ll devote a Yarn Along post to my research into the world of blocking – we’ll see. Photos to come. A free weekend plus a Mad Men marathon ALSO equals a knitting hangover. Does anyone else get these? I felt awful on Monday morning! I estimate that I knit for about nine hours on Sunday – nearly nonstop, though I tool a 45-minute break at one point. The right side of my body was stiff and throbbing from my temple down to my rib cage – and I must have been furrowing my brow too because I woke up on Monday with a nasty headache. After I finished the tank, I cast on an English rib pullover for moi. This pattern is an old favorite, but I’ve never made one for myself. Don’t ask me where the idea for two brown sweaters in a row came from. I normally never even think of brown as an option for sweaters. Maybe I should see my doctor and have her up the dosage on my antidepressants? Just kidding, of course. Brown appeals to me these days. It’s stately and dignified and almost forty, just like I am. I’m reading Adam Johnson’s The Orphan Master’s Son and enjoying it – and yes, I’m still trying to focus on finishing all the books I’m in the middle of – but I also have a confession to make. I started A Storm of Swords. I really didn’t mean to, but I was talking about the series with a college-aged acquaintance who has read all the books and spends time arguing with other George R.R. Martin megafans on various websites, and one thing led to another and the next thing you know I was reading it. I’ll try not to review it until I know for sure whether I like it or not. I think my posts on A Clash of Kings made me seem a little indecisive. 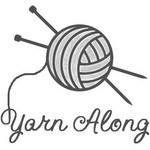 Knitters… has anyone read a novel called Wool by Hugh Howey? It’s one of the many, many post-apocalyptic/dystopian novels to hit the shelves in recent years – and it ALSO happens to be organized around a series of knitting metaphors. Its chapters all have titles like “Casting On,” “Binding Off,” etc. I’m very curious to see how the author bridges the worlds of knitting and post-apocalyptic fiction. 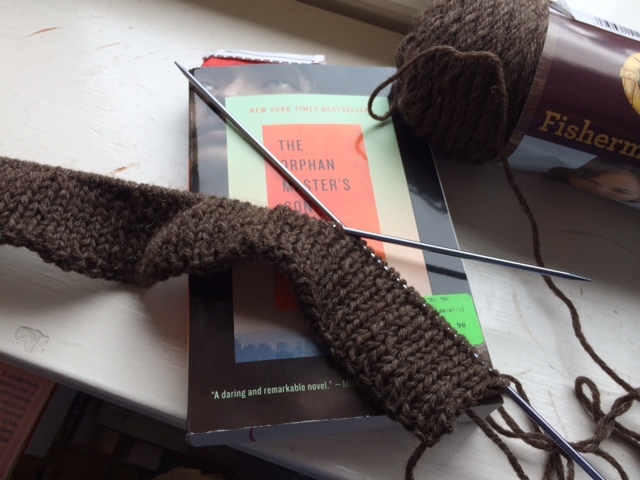 your reading habits are sort of like my knitting ones…..next thing I know, i’ve cast on yet another something. ho hum. eventually they (might) get finished!!! I’m like that with both knitting and reading… And am only getting worse!